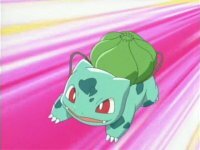 Japanese Episode AG 074: "Fushigidane to Fushigidane! Monsutaa Booru o Torikaese!!" 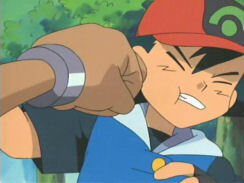 American Episode 346: "Hokey Pokéballs!" Satoshi and the others arrive in a new town, where Haruka shows her Fushigidane the joys of a big city. Meanwhile, the Rocket-Dan are at the Pokemon Center, posing as repairmen to sabotage the Center's Monster Ball transport system. Satoshi and the others eventually end up at the Pokemon Center, where a video phone conversation between Satoshi and Orchid-Hakase takes place. Satoshi convinces the professor to send him his Fushigidane, but the pokemon won't come out when its Monster Ball arrives. It turns out that the Rocket-Dan have reworked the machine to deposit the Monster Balls into their Nyasu balloon while replacing the trainers' Balls with fake Monster Balls! The Rocket-Dan manage to get away, but Satoshi and the others are able to catch up with them. With the use of teamwork, both Satoshi's Fushigidane and Haruka's Fushigidane send the Rocket-Dan blasting off. After the pokemon are reunited with their trainers, Orchid-Hakase contacts Satoshi and tells him that the grass and water-type pokemon are fighting again. Satoshi sends his Fushigidane back to Orchid-Hakase and then resumes his journey to Hiwamaki City. Eh, I have mixed feelings about this episode. Part of me is upset over the fact that Satoshi brought back his pokemon (even if it is only for one episode) because it sort of ruins the whole "let's get through Houen with only my Houen pokemon" thing that the series started out with. I had thought that one of the ideas behind that was to showcase the fact that Ruby and Sapphire aren't compatible with the older games, so seeing Fushigidane transported so effortlessly is a bit of a letdown. Then again, it's not like Fushigidane helped with a Gym Battle or anything like that, so many would argue that its appearance in Houen doesn't really matter. In any case, the episode was an entertaining filler, even if it wasn't particularly memorable. As far as the dub goes, the one thing that I thought would get censored actually was. So no surprises here. I know I give 4Kids a hard time for making mistakes that the Japanese version doesn't, but this time I have to praise them for actually fixing a mistake present in the Japanese version. So you know the part where Satoshi's and Haruka's Fushigidane are looking for the Rocket-Dan and come across a Kinokoko and a Konohana? And how they talk to each other in their pokemon language while Satoshi's Fushigidane uses one of its vine to kind of illustrate the Rocket-Dan's Nyasu balloon? Well, the Japanese version actually mixes up Kinokoko's and Konohana's voices! Kinokoko says "Kono..." while Konohana says "Kinoko" when it should be the other way around. And they don't just do it one time either! The mix-up occurs throughout the entire scene, making it a very amusing scene to watch. 4Kids actually fixes this mistake in the dub and has the two pokemon speak with the proper voices, proving that 4Kids can change things for the better in certain situations. When Kojirou hits the Okorizaru's Monster Ball with the ski like a baseball, the pokemon comes out and punches Satoshi in the face. 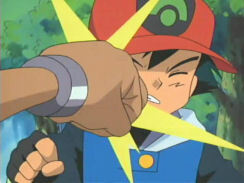 In the dub, the actual impact of the punch is replaced with an impact star swiped from another episode. James: "I knew all my scouting years would finally pay off." Kojirou doesn't make any mention of his past like this in the Japanese version. I realize that it's an extremely minor thing to bring up, but the Rocket-Dan's past is hard enough to straighten out without the dub coming in and making it worse. The rest of these are just time cuts. A second is cut from the pan right after Kids' WB! 's final commercial break. And the TO BE CONTINUED... screen is shortened by two seconds.